All actors do that. Should do that and do that. For the most part. I say all actors. I'm exaggerating, but you know who does and who doesn't. 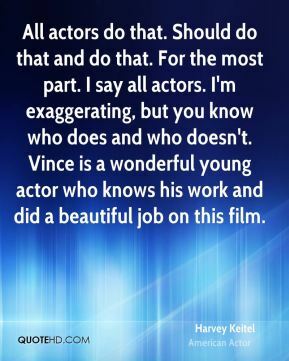 Vince is a wonderful young actor who knows his work and did a beautiful job on this film. Everything is difficult, and everything worthwhile is difficult. 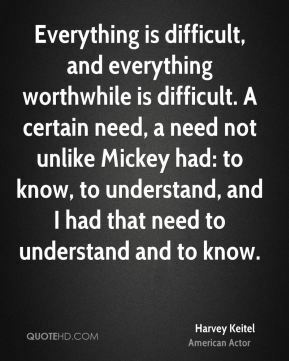 A certain need, a need not unlike Mickey had: to know, to understand, and I had that need to understand and to know. Hardly any actor objects to press. 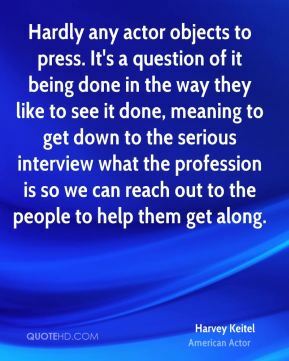 It's a question of it being done in the way they like to see it done, meaning to get down to the serious interview what the profession is so we can reach out to the people to help them get along. 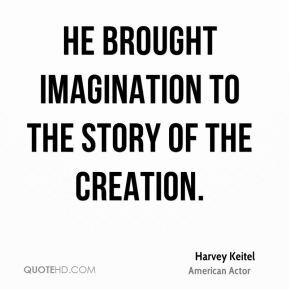 He brought imagination to the story of the Creation. I don't think about those things, really. I work hard on everything I do. 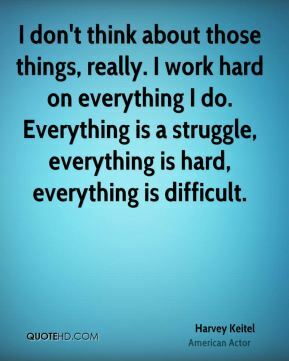 Everything is a struggle, everything is hard, everything is difficult. 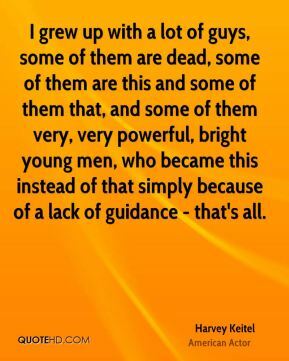 I grew up with a lot of guys, some of them are dead, some of them are this and some of them that, and some of them very, very powerful, bright young men, who became this instead of that simply because of a lack of guidance - that's all. I've always found it not only easy, but enjoyable. It's necessary for us to reach out and I'm speaking for myself here. 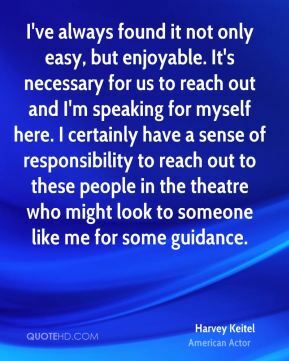 I certainly have a sense of responsibility to reach out to these people in the theatre who might look to someone like me for some guidance. It's a very, very fascinating story for me, cause it's about a man who's been doing bad; bad things. 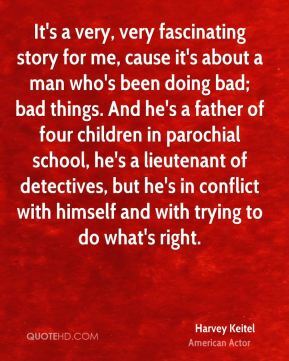 And he's a father of four children in parochial school, he's a lieutenant of detectives, but he's in conflict with himself and with trying to do what's right. So there's no such thing as one too many this, one too many that. 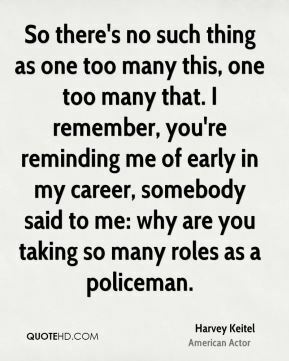 I remember, you're reminding me of early in my career, somebody said to me: why are you taking so many roles as a policeman. 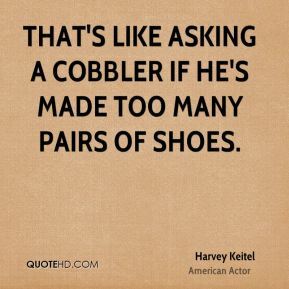 That's like asking a cobbler if he's made too many pairs of shoes. 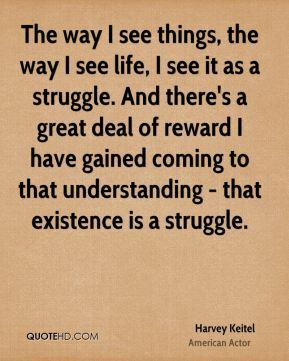 The way I see things, the way I see life, I see it as a struggle. And there's a great deal of reward I have gained coming to that understanding - that existence is a struggle. 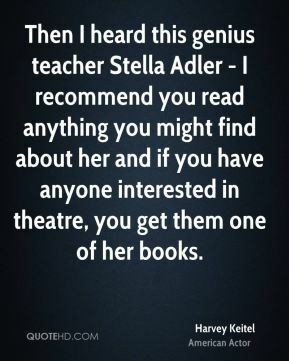 Then I heard this genius teacher Stella Adler - I recommend you read anything you might find about her and if you have anyone interested in theatre, you get them one of her books. To create characters, one must build background. 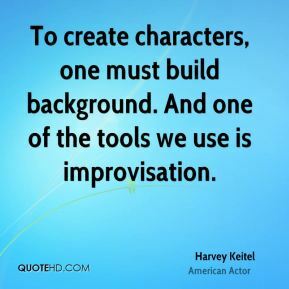 And one of the tools we use is improvisation. Uhm, I'm the one wanting the lessons! 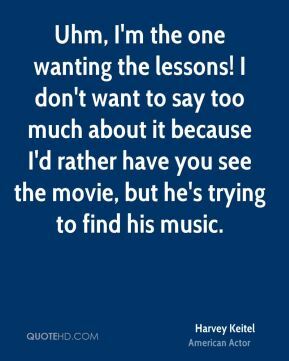 I don't want to say too much about it because I'd rather have you see the movie, but he's trying to find his music. Well unfortunately I didn't work with Andre much. 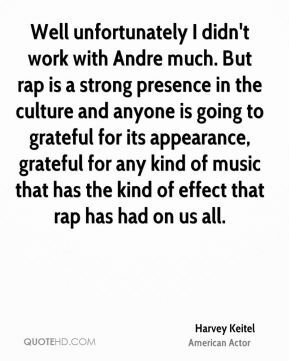 But rap is a strong presence in the culture and anyone is going to grateful for its appearance, grateful for any kind of music that has the kind of effect that rap has had on us all. 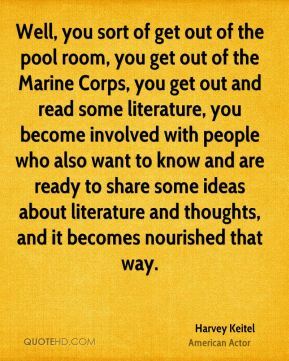 Well, you sort of get out of the pool room, you get out of the Marine Corps, you get out and read some literature, you become involved with people who also want to know and are ready to share some ideas about literature and thoughts, and it becomes nourished that way. 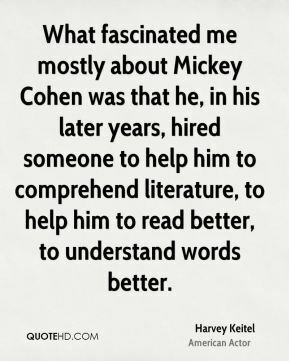 What fascinated me mostly about Mickey Cohen was that he, in his later years, hired someone to help him to comprehend literature, to help him to read better, to understand words better. 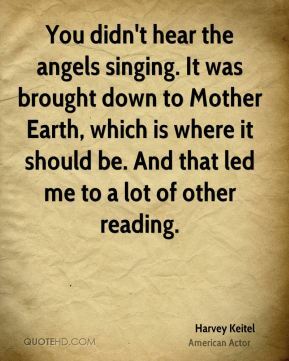 You didn't hear the angels singing. It was brought down to Mother Earth, which is where it should be. And that led me to a lot of other reading. 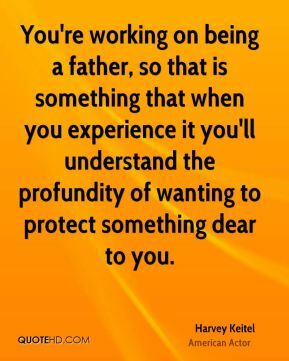 You're working on being a father, so that is something that when you experience it you'll understand the profundity of wanting to protect something dear to you.